If you are searching for a Golden Retriever puppy, I think you are making a great choice. They are absolutely wonderful pets, friends, and family members. Up to this point, I have had 3 Golden Retrievers, and I am sure there will be more. The 3 most popular places to get a Golden Retriever puppy would be adoption from a rescue or animal shelter, purchasing from a breeder, or purchasing from a private family dog. None of these options would be free, but an adoption from a rescue or animal shelter would be the least expensive. I would caution you on receiving a free Golden Retriever puppy, since they are a great dog, and unless there is something wrong with the puppy, people aren’t generally giving Golden Retriever puppies away. 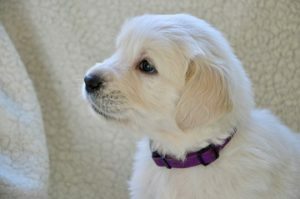 A fee Golden Retriever puppy might have many health issues. 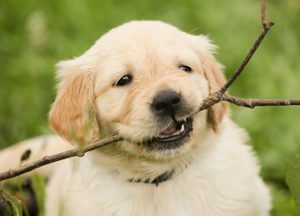 Let’s take a look at if free Golden Retriever puppies is possible, and what are some of Golden Retriever health problems, since their health problems could be directly related to the price of a Golden Retriever puppy. Adopting a Golden Retriever, or any dog for that matter, is a great thing to do. There are so many puppies and adult dogs that are in need of a great family to take care of them and give them the love that they deserve. If you are looking to get a Golden Retriever, it is best to get one from a rescue that specializes in Golden Retrievers. They will have a great idea on the health problems that Golden Retrievers are prone to. Adopt A Pet is North America’s largest non-profit pet adoption website and a great place to start your search. They will be able to show you available Golden Retrievers in your area. You will even be able to follow along on the health of a dog you are interested in, as it receives special care before being available for adoption. The cost of a Golden Retriever will vary from where you get your puppy. Getting a rescue dog will usually cost between $100 to $300, sometimes more. If you are choosing to get a Golden Retriever puppy from a breeder, make sure the breeder is reputable. Verify that the breeder does genetic testing of their animals and verify the puppy’s health information before committing to purchasing one. 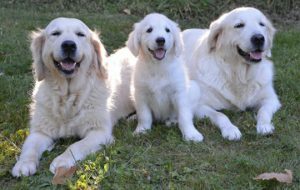 You might have to drive several hours to find a breeder that you trust and that has puppies available and what you are looking for in your Golden Retriever. The cost of a Golden Retriever puppy from a reputable breeder will be quite spendy. The cost could range from $500 to $4000, depending on if the puppy is coming from a working dog or a show dog with bloodlines. There are plenty of people whose family dog will have puppies, and now they are trying to sell the Golden Retriever puppies. All 3 of my Golden Retrievers have come from families where their family dog has puppies. Many families sell puppies from their family dog. You are going to want the same information from the family as you would want from a breeder. Does their dog or the sire dog have allergies? Are there any genetic disorders that either the mother or father have? 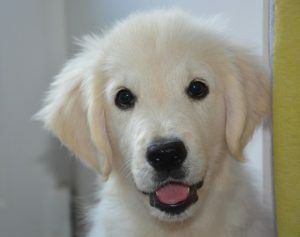 The cost of getting a Golden Retriever puppy from a family will range somewhere in between the rescue and breeder cost. Generally you will pay anywhere from $500 to $900 for a Golden Retriever puppy. A Golden Retriever is one of the top most favorite dogs in the United States. Unfortunately, this popular breed can have several health problems that you should be aware of. Please keep these in mind if you are getting a free Golden Retriever, or a Golden Retriever that is less expensive, there still could be many expensives that pop up later in life. Hip And Elbow Dysplasia – Goldens are know for having hip and elbow dysplasia. This is when the bones and joints will actually rub on each other and can be quite painful. As a young puppy, your veterinarian can take X-rays and determine if your puppy is likely to have this disorder. There are things that they can do to help, but it is quite expensive. Allergies – Golden Retrievers frequently will have food and many other allergies. It can range from mild to quite severe. You may have to purchase better quality dog food to help keep it under control. Ear Infections – Like all dogs with longer floppy ears, Golden Retrievers will get ear infections. There are many things you can do to help prevent how frequently or how bad their ear infections will be. Be aware of the health problems that Goldens can have. Sub-Aortic Stenosis – This is an inherited heart condition. Your veterinarian can detect the problem and prescribe a proper treatment. Osteosarcoma – This is a malignant bone cancer. There are treatment options available, but it is very aggressive and the long-term prognosis is usually poor. I have lost 1 of my Golden Retrievers to this. Lymphoma – This is a cancer that originates in the blood and often difficult to diagnose. Treatment usually would be chemotherapy. Obesity – I think this happens more often because Golden Retrievers are so darn cute and are capable of giving you the saddest face when we are eating. They end up having too many table scraps. Hot Spots – Golden Retrievers many times have skin conditions. A lot of it is due to their allergies, but hot spots can develop from your dog scratching or chewing on their skin. There are many home remedies for dog itching that you can use. As you can see, Golden Retriever health problems can get quite expensive if you don’t have a healthy Golden Retriever. That would make me concerned if someone is offering free golden retriever puppies as to what might be wrong with the puppy medically. Even with getting a Golden Retriever puppy from a rescue, there are costs associated with the adoption. To help you from getting blindsided later with additional expenses, I think it is important to know upfront what additional unexpected costs may head your way. Golden Retrievers are wonderful family members, and by no means would I want to scare you away from getting one. Even with some of mine having health issues, I still think they are the best. When I lose my 11 year old Golden Retriever, there will probably be another one that follows him. They offer such a great friendship and companionship. 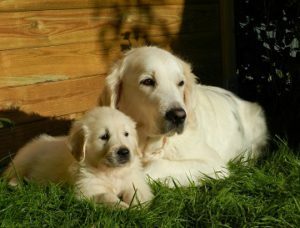 If you would like some additional information about Golden Retriever puppies, read 10 things you should know about them. Remember, anything worth having is very rarely free. I hope you find a wonderful Golden Retriever puppy.